It’s been a year since I started this blog and I am still figuring out which direction I am headed with it. I have bursts of blogging motivation and then I have periods where I am just not feeling it. And then there is the whole time commitment. Especially if I am doing an informative post-the research takes time! Sometimes I feel silly, and other times I remind myself that I started this blog for me-not for anyone else. Anyways, life has been fairly busy lately: substitute teaching at three different schools, waitressing nights and weekends, along with some fun stuff! Today marks the first day of my ‘Spring Break’ according to the school schedule, despite the less than spring like weather. Hopefully it will warm up soon! 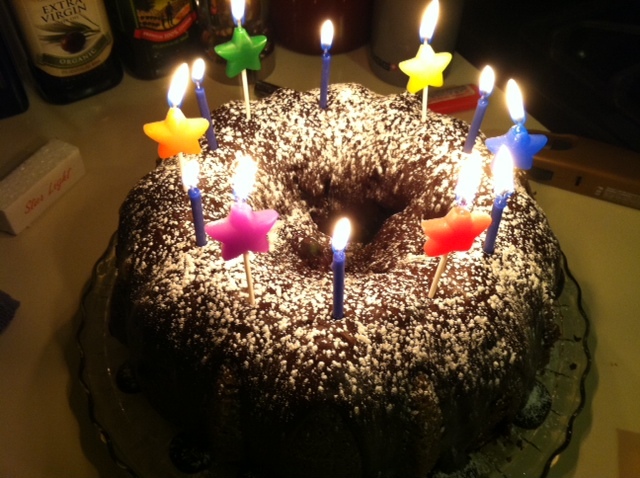 The Birthday Bash: Last week was my brother’s birthday and his spring break from college. I was so pumped to see him, even if it was only for a couple of days. We had lots to catch up on! 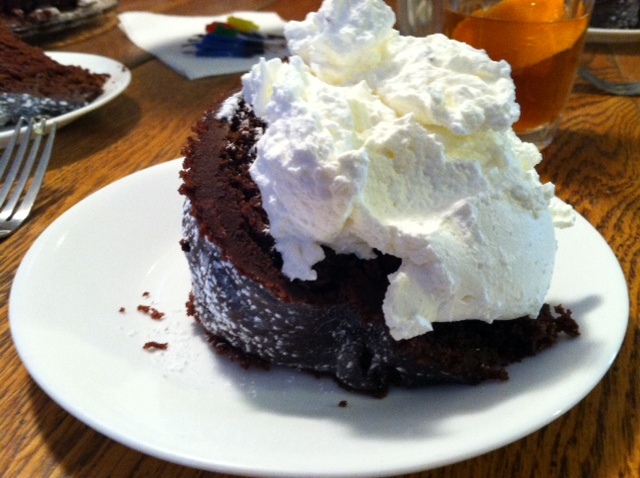 Our family tradition for birthdays is that we get to choose what we’d like to have for dinner and dessert. Chicken fajitas and dense chocolate cake! Last week my Mom and I took a day to go shopping and out for lunch. It was a much-needed day! I always forget how exhausting shopping is though! I hadn’t been to Target in ages and was needing to get my fix. I have been wanting to buy some things to make my apartment a little more ‘home-y’. 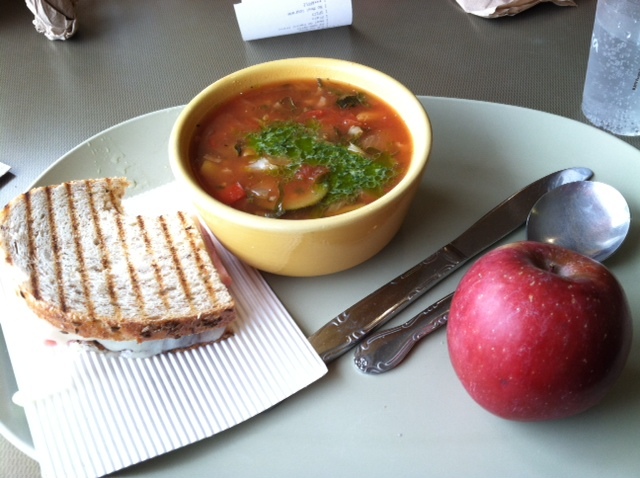 And lunch at Panera is always a win! Perfect for a Gloomy Day: Vegetable Soup plus a Grilled Ham and Cheese! Signs of Spring: I am finally starting to crave my giant salads again. During the winter I crave warm comfort food, so salads have taken a backseat for a bit, but my love for a huge plate of veggies is slowly coming back! Must be a sign of Spring! 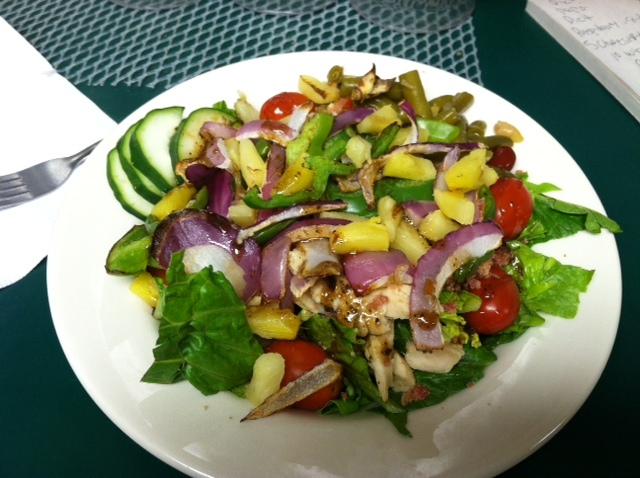 One Benefit of Waitressing: The Salad Bar! Another sign of Spring? 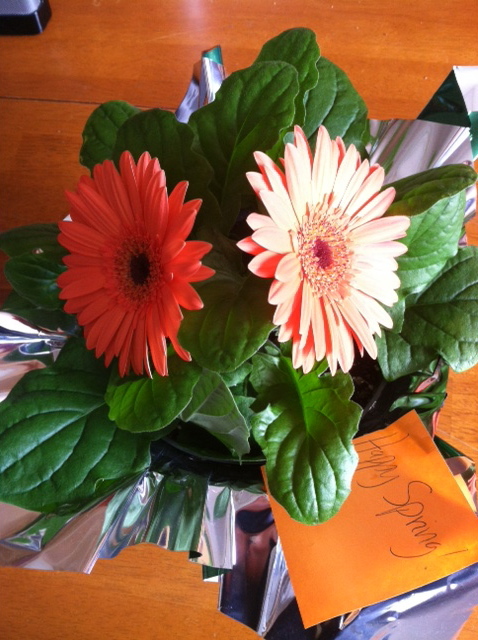 The Gerbera daisies that my Mom surprised me with at work! I was so excited when she showed up with these beauties! Um, clean up your room? No thank you. 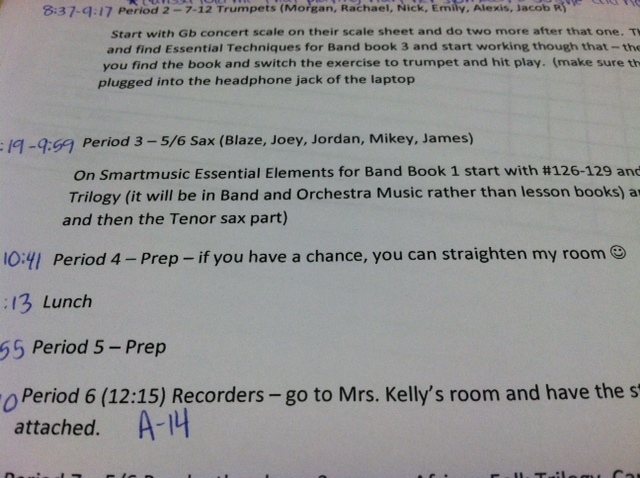 I couldn’t believe that this request was part of the teacher’s plans. I had never subbed for that teacher before so how was I supposed to know what to do with the piles of paper and random instrument pieces laying everywhere? Messy classrooms are a pet peeve of mine, can you tell?! 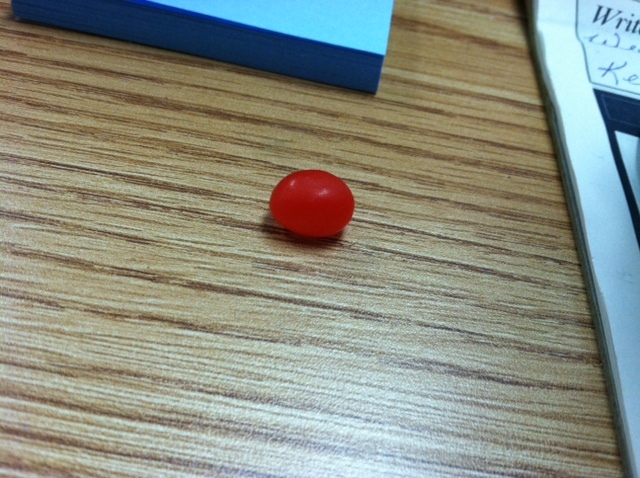 A single jellybean! How sweet of him! I thought this was incredibly amusing, but I didn’t eat the jellybean-too many questions concerning its whereabouts! Even though I am still working at my waitressing job over Spring Break, I am looking forward to having some more down time. I am also hoping that the sun will begin to make more of an appearance so I can get some good runs in! Are you going anywhere for Spring Break? This post has been a long time coming. 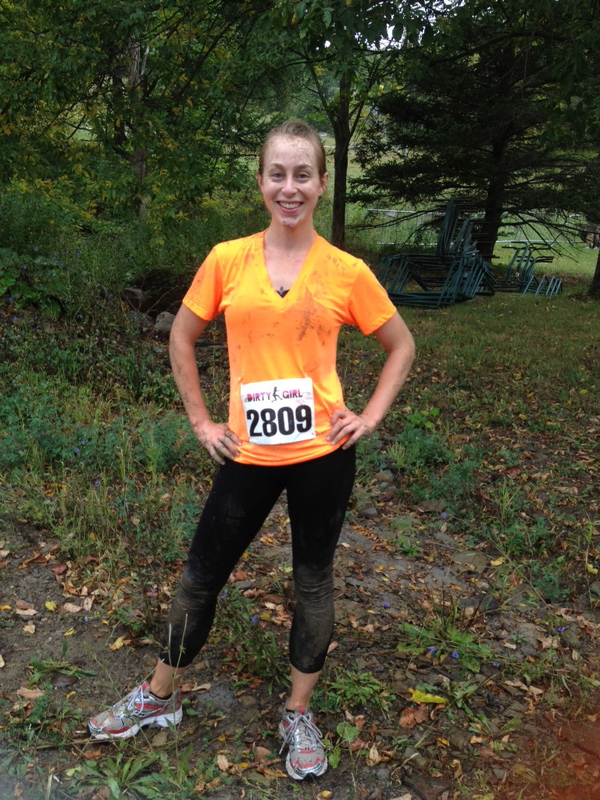 I participated in the Dirty Girl Mud Run in September. Oops. At the time I was kind of on a hiatus from blogging. The Dirty Girl Mud Run is an obstacle course designed for women of all fitness levels. Part of the funding for the race goes towards breast cancer research. the race focuses on providing women with a fun way to step out of their comfort zones. I signed up with a friend as a last minute deal. So we ended with a start time of 8am. Good thing I am a morning person! The race was two hours away, so I stayed with my brother the night before. 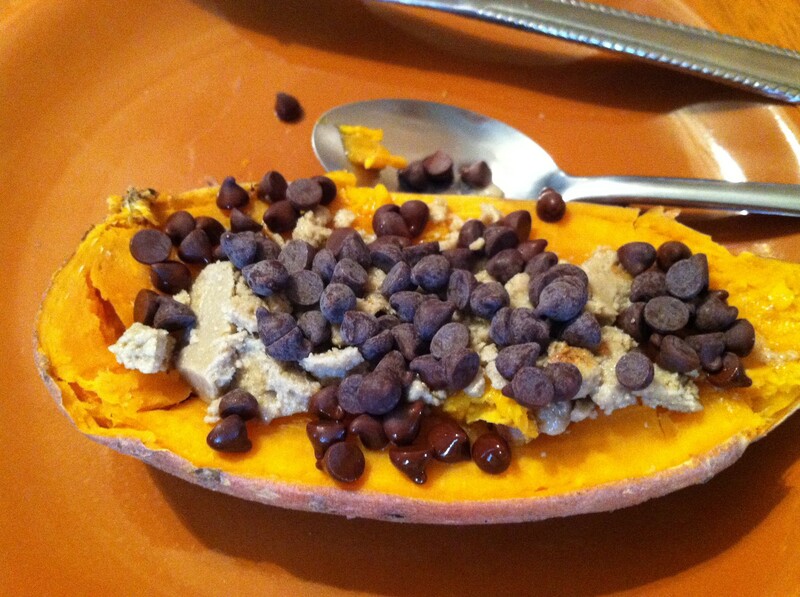 I also made sure to carb up with a sweet potato topped with yogurt, sunbutter, and chocolate chips! Not sure if this really helped with the run, but it was tasty! I didn’t sleep very well the night before the race due to nerves-I couldn’t believe I was actually doing this! We were on way to the race venue at 5:30 am. Unfortunately, it was raining. 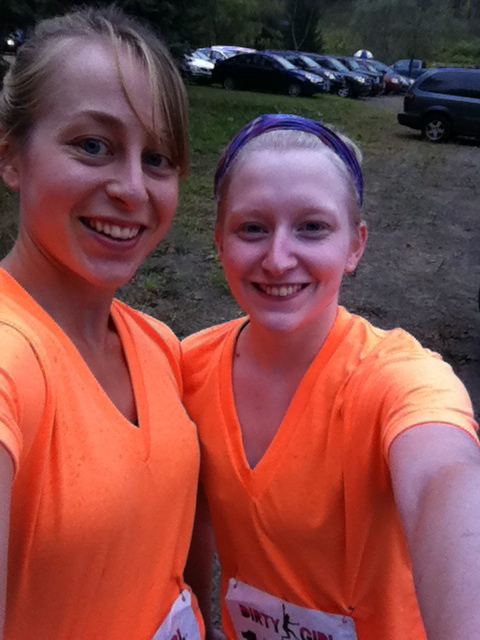 However, this didn’t end up being much of an issue because rain or no rain, we still would have gotten muddy! The race was being held at a ski resort. We arrived and picked up our race packets, or numbers, tshirt, and necklace. I was under the impression that we would have a whole bag of goodies, but that was a no go. The calm before the mud! Before the start of the race the announcers played music and pumped up the crowd. We were all super nervous and cold and just wanted to run! The course started out at a serious incline. My friend and ran on the outside of the crowd and I managed to get ahead of a lot of the other runners. Check out the incline that we were met with at the start! The first obstacle was a huge, inflated incline. Slippery fun! After the first obstacle, my nerves started to disappear. Because we were in such an early heat, there were very few runners around us. This made going over the obstacles much easier. The other obstacles included walking through mud and water pits, climbing over walls, crawling through mud underneath a net, and climbing over a huge cargo net. The cargo net was the most difficult obstacle for us-we were so nervous about falling! And heights are not my favorite. Besides a few intense hills, I would say that the run itself was fairly easy. I felt like I was running with a huge grin on my face-I was so happy to be running through the mud and climbing over the obstacles! At the end of the race we had our picture taken and it was immediately sent to us via text message. Technology is so wonderful! After getting cleaned up we wandered around some of the venues. And purchased some of the Dirty Girl goodies! This may have been my favorite part of the day! I snatched up a new tech running pullover and a sweet beanie. I have a bit of an obsession with all things clothes! The end result: muddy and happy! 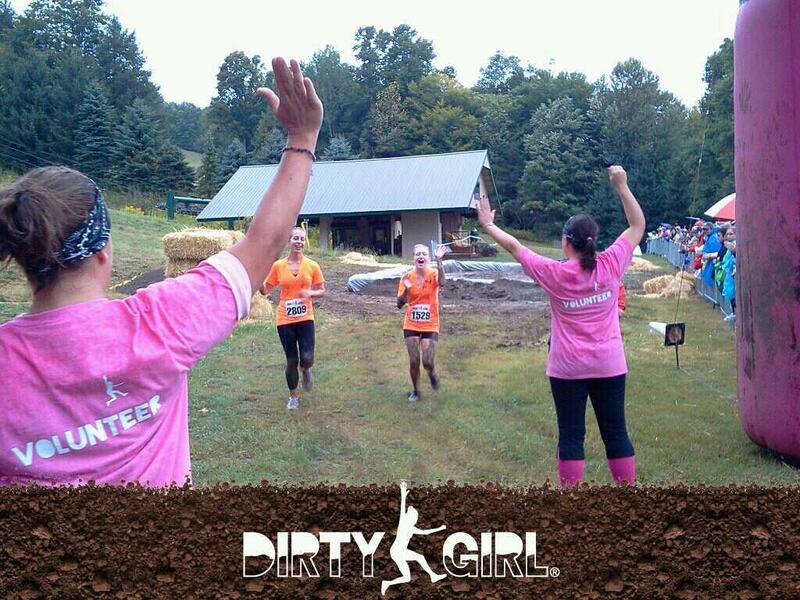 I would definitely recommend participating in a Dirty Girl Run. I would also suggest doing it with a larger group of friends/family-there were all sorts of groups with fun outfits! 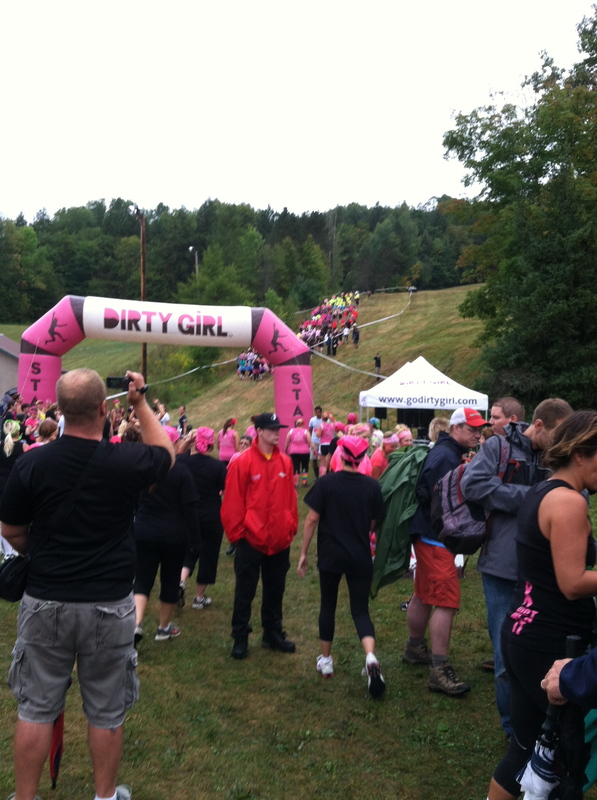 Have you participated in a Dirty Girl Run or similar obstacle run before? As I said before, Santa was very good to me! 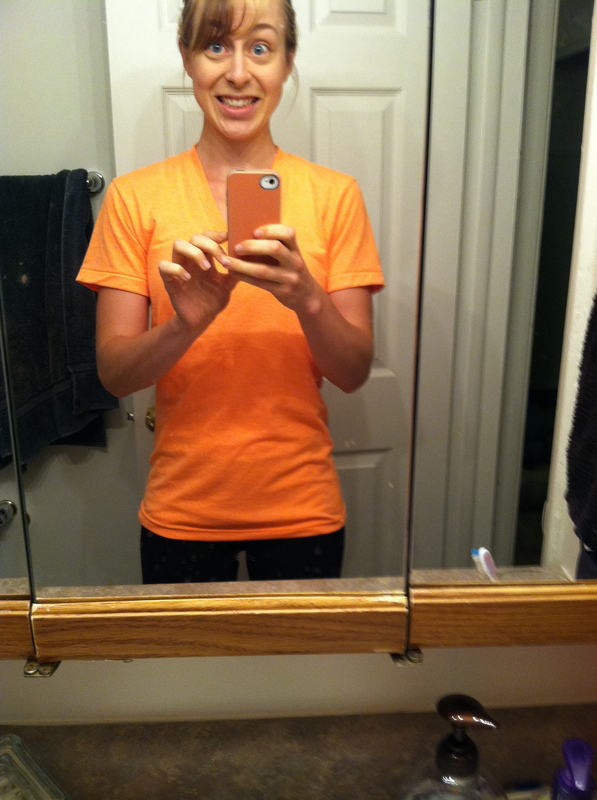 Not only did I get some awesome cold weather running gear (no excuses now! ), but I also got a crock pot, a set of Burt’s Bees lip balms, and Lunch bots!! So far I have plans to make this and this in my brand new crock pot..any other recommendations? I am hoping to cut my food prepping time in half! I love Burt’s Bees products-so far I have only tried the grapefruit lip balm, but it’s a win! It reminds me of those grapefruit gummies…And the lunch bots are a tupperware queen’s dream! I love the little baby containers and the larger ones are perfect for salads on the go! And now for a drum roll please… Because one of the most exciting gifts was my very own Well Fed cookbook! Followed by squeals of excitement after I opened it and there was a note from the paleo rockstar herself: Melissa Joulwan. So I am a little obssessed. But who wouldn’t be?! Her recipes are unique and delicious, easy to follow, and every recipe in her book has a picture! Even if you aren’t a self-proclaimed Paleo follower, you should own this book! P.S. Apparently my Mom and Melissa did some emailing…and Melissa checked out my blog! Oh goodness…being new to the whole blogging world, I still get a little nervous/intimidated when talking with ‘real’ bloggers!